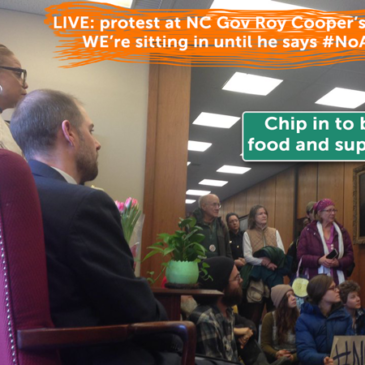 This morning, in a surprise addition to a planed day of action challenging the Atlantic Coast Pipeline, a muti-state coalition of activists stormed the lobby to the governor’s office and are refusing to leave until the governor or his staff will meet with them. Activists were angered by Governor Roy Cooper’s decision last Friday against all evidence and reason to nonetheless green light ACP construction. Activists have been occupying the office since 8:30 am, and have vowed not to leave until the Governor revokes his approval. Police are allowing the demonstration to continue uninterrupted, resulting in a stalemate where activists are getting food delivered and bringing in sleeping bags, readying themselves to stay all day and into the night potentially. A live stream, including an hour long meeting with the Governor’s chief of staff is here​ and you can chip in to support the activists here. A few things you can do to help right now! 3) Tell Raleigh NC people to come join us – especially students and anyone free in the middle of the day. The police are making no move to remove us, so we’re digging in to occupy until 5pm when the building closes.